In the Tank on Friday was the first walk out we have seen in Shark Tank history. The scenario seemed harmless at first when Christopher Gray, founder of the scholarship app “Scholly” asked for a relatively small $40K investment for 15% of the company. Mesmerized by the inventiveness of the idea alone, Lori Greiner pounced early on with an offer matching Gray’s original asking point. 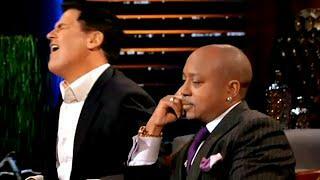 Daymond John joined her and Gray was pressured to accept before the investors proceeded to any of the “real” questions. Greiner came out and explained, “Listen to me. I don’t care how we are going to monetize it. I just want you to take my hand and say deal.” Mark Cuban, Robert Herjavec, and Kevin O’Leary took great exception to this idea, and, after a heated debate, walked off the set. So, what can we all learn from this rather interesting incident in the Tank? The reason Lori and Daymond pounced so quickly on a deal was the fact that Gray himself has won $1.3 million in scholarships on his own. Right after he said that, the Sharks were extremely surprised and instantly had a high interest in Scholly. Why is that? Well, Gray built what is known as ethos in his product. Having gone through the scholarship process meticulously and tediously himself, Gray proved to the Sharks that he has experience and expertise in the field. Thus, he built a sense of trust and respect for his app. In your business, it is imperative to have experience and interesting personal histories in the field of your product in order to draw immediate interest. Astonishing success in your industry can lead to instant leads and buy-ins from consumers and investors alike. It seems evident by the end of the episode that Daymond instantly supports the product due to his emotional connection with Gray–both lived with single mothers and thus had a shared experience. In business, this connection–known psychologically as pathos-based reasoning–can yield mixed results. While often a “gut instinct” can lead to a right decision, more often than not, this is not the case. Mark was accurate when he claimed that no one knew about the true mechanics of the business yet. As Gray was about to address a question about a potential issue with the updating of a database, he was cut off by Lori’s plea to make a deal. In business, you need to consider your emotions. While it may not be best to rely solely on them, it is also harmful to completely cast them off. When faced with a challenging decision, consider the pros and cons of your emotional instincts and make the smart choice. Gray didn’t think twice hardly before he accepted the deal from Lori and Daymond. As Mark, Robert, and Kevin are actually based in the technology sector it is feasible to think that it might have been a better decision to hold off for them. However, aside from the fact that the deal was exactly in line with his asking point, Gray, as explained in his post-Tank interview, was happy to see that Lori and Daymond believed in the product and cause. It is so important, that consumers especially see that you believe in more than the bottom line and fight for the social change that your product represents.